Manchester - Louis van Gaal admitted on Friday that he has no answers to explain Radamel Falcao's failure to make his mark at Manchester United. Falcao's troubled spell with Van Gaal's side hit a new low in midweek when he lasted just 71 minutes of an Under-21 game against Tottenham, a demotion that was intended to improve the on-loan Monaco striker's fitness and sharpness. The United manager has refuted suggestions that Falcao's presence with the club's youngsters could be interpreted as an embarrassment for a Colombia international who would cost £43.2 million to sign on a permanent deal from Monaco. But Van Gaal did confess that he cannot explain why Falcao has scored just four times this season and failed to make any sort of impact in the United line-up. "Falcao didn't play his best match in the second team but he tried to do his utmost best, more I can't ask of players," Van Gaal said at a press conference on Friday. "I let my players play in the second squad. I have read that it's a 'humiliation' but I don't think so. "It's a professional attitude, a professional attitude of the manager, of his management of the club but especially also from the player. "Not only Falcao has played, also (Victor) Valdes, also Rafa da Silva has played. Rafa da Silva played a very good match and scored a wonderful goal and because of that he can grab his confidence again. "Every player needs match rhythm. We pay a lot for the players so it is normal they play football for us, that is also in the second team. "He has not reacted like the media have reacted. I have explained already five months ago that every player who doesn't play has to play sometimes, not regularly, but sometimes when we think it's needed to play more minutes in the second team." Falcao cost United a £6 million loan fee when he joined last year and commands a reported £265 000-a-week, but while the manager will not give a definitive answer on the player's future, his latest comments - and his bafflement at Falcao's failure - suggest there is little chance of him remaining at Old Trafford beyond this season. 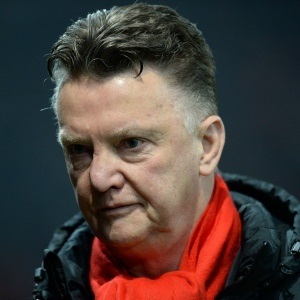 "You never can say that," said Van Gaal when asked to explain Falcao's lack of form. "We are looking for the solution for him but a lot of aspects you can't control as a manager, nor as a player. "That's also the beauty of the football world, that you can give fantastic performances in another country but not in the country you are playing in presently. "This is not the first example and it shall not be the last example. A lot of players need more time to adapt to the new situation, to the new culture, to the higher rhythm of the English game - to a lot of aspects. "You can easily write 'He can't play football'. But I can't say that and don't want to say that because Falcao, and all the other players, are working very hard and I'm very pleased with their attitude."